At KDAB we believe in doing business collaboratively and focusing on our core strength: technical expertise in Qt, C++ and OpenGL that is second to none in the world. In order to help our customers be successful broadly, we partner with a variety of companies who share our values and are equally committed to excellence. As the first partner of Trolltech, the original creators of Qt, we’ve always been very closely collaborating with the stewards of Qt, be that Nokia, Digia or now The Qt Company. Our personal relationships with the Qt team go back to the late nineties of the previous century. We contribute greatly to Qt development and are proud to be Qt’s premium partner. The Qt Company and KDAB create the Qt Automotive Suite together, organize and run events like Qt Developer Days, Qt World Summit or the Qt Contributor Summit together and frequently exhibit at trade shows or present at conferences together. KDAB also serves as a reseller for Qt commercial licenses. Automated user interface testing is a regularly recurring requirement in many of KDAB’s projects. So much so, that we used to have our own product for it, KD Executor. Squish has established itself as the clear market leader for automated UI testing and support tools for Qt developers, however, so we decided to give up on trying to compete with our friends at Froglogic and instead have become their main partner for services and trainings. We use Froglogic Squish a lot and are happy to recommend it to our customers and help them be successful with it. 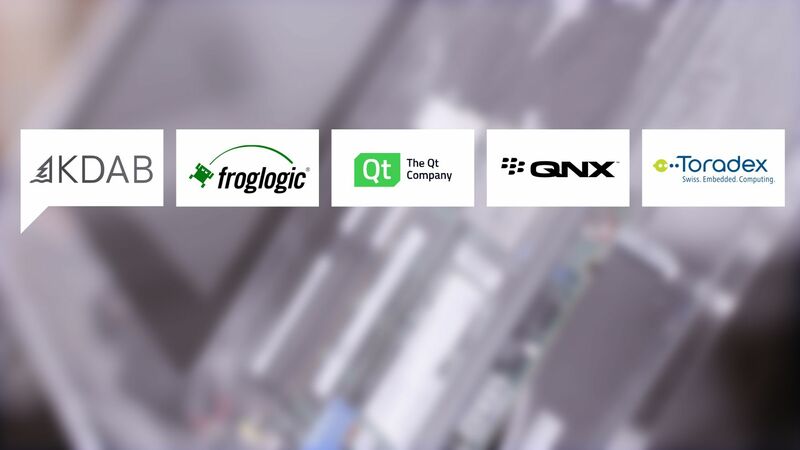 QNX Software Systems Limited, a subsidiary of BlackBerry Limited, is a leading provider of operating systems, middleware, development tools, and professional services for connected embedded systems. Global leaders such as Audi, Siemens, General Electric, Cisco, and Lockheed Martin depend on QNX technology for their in-car electronics, medical devices, industrial automation systems, network routers, and other mission- or life-critical applications. KDAB has been working closely with QNX and BlackBerry on bringing Qt to their operating systems and products for several years. Their customers frequently call on KDAB to help with platform migrations and application level and UI challenges. Jointly KDAB and QNX are ensuring that Qt remains fully supported and has optimal performance on QNX. Our source of TFT displays, Global Display Engineering have partnered with KDAB to enable their RipDraw content creation toolchain to support Qt and QtQuick/QML. Toradex is a leading vendor of ARM based Computer on Modules(COM) / System on Modules(SOM) that can be used for diverse embedded applications. We use their products in our embedded trainings and help their customers with all things Qt, particularly on embedded Windows platforms.